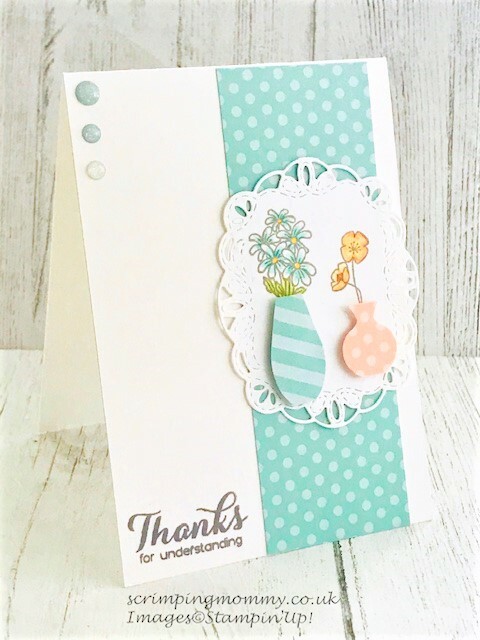 scrimpingmommy: Vibrant vases thank you card. Vibrant vases thank you card. The most popular type of card I make and send out is thank you cards. I send HEAPS every month to customers and crafty friends. Therefore, I am always thinking of new cards to send. Today's card is a pretty one and so easy to make in very little time with the help of Vibrant Vases stamp set and vase builder punch from Stampin' Up. Come closer let me tell you more...…. Vibrant Vases is a super versatile set as it co-ordinates with our Varied vases stamp and Vases builder punch, so all three work together. Having both sets or even one gives you a heap of card possibilities. The punch allows you to punch out the cute vase shapes too which makes for precise shapes and speedier crafting. I love co-ordinating stamps and punches they make my life easier. I stamped my choice of blooms onto a die cut shape from Stitched labels and carefully coloured them with water colour pencils. I find colouring so relaxing. I used a small strip of Pool party designer series paper from the subtles 6 x 6 stack, and some glitter enamel dots to pull out the colours, using just one vase punched in Petal pink to give a contrast. Popping the vases up on dimensionals makes them look 3d, and really finished the card of perfectly. A super easy card to make I hope you will give this one a try for yourself. As always all the products used today will be listed below for you to shop with ease.